Relax. We'll do the cleaning. Northaven offers comprehensive housekeeping services to assist both our independent living and assisted living residents to maintain a safe and clean home. Our Independent Living residents receive a free apartment cleaning each month. 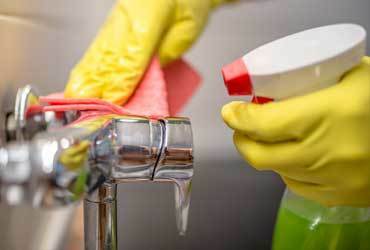 This complementary cleaning includes vacuuming, dusting, cleaning of kitchen surfaces, sink and floor, and cleaning of bathroom sink, tub, toilet and floor. Residents may book additional cleanings at $12 per visit. Additional housekeeping services are available at an additional $12 per item. Our Assisted Living residents receive weekly housekeeping and laundry service at no additional charge. Our weekly cleaning service includes vacuuming, dusting, mopping, freezer and refrigerator cleaning, and cleaning of shower and bathroom sink.